MADAWORKS VIDEO LAUNCHED AT INTERNATIONAL CONFERENCE. SCHOLARSHIPS WILL BE AWARDED IN AUGUST! Spring was a very busy time for team Madaworks! 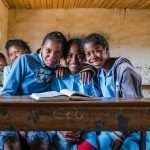 After our trip to Madagascar to deliver the scholarship applications and the funding for the scholarships, we worked hard to create some amazing work. Please enjoy our photo journey and videos made from hours of field footage. Thanks to all the friends on the ground in Madagascar and our team at Madaworks. I hope these images will bring you closer to this incredible island nation and the work we do. The completed video on our website home page is the great work of Red Summit Productions. We have created a YouTube channel for Madaworks and invite you to view the video there as well. We will be adding more videos throughout the year so please subscribe to our channel! The beautiful photography on our website and our social media is from Filipe Amado. Filipe also contributed a stunning video for us which can be viewed above this post. The editors and the directors did an amazing job. Thanks guys! We launched our video at the Women Deliver 4th Global conference, (5000 attendees) May 16-19 in Copenhagen, Denmark. The response to Madaworks was very positive and more than 300 people asked us to bring our program to their home countries. I told them after we are done helping Madagascar we will certainly consider it! There are numerous wonderful organizations working globally on important issues addressing the SDGs and empowering women. We want to partner and collaborate with some of these groups to help us expand to all regions of Madagascar. We will get there, one girl at a time! While in Madagascar we replenished our stock of donor gifts by purchasing baskets and scarves from the women’s cooperatives we support. The beautiful and intricate baskets are made in the village of Sahavondronina, the hometown of our first student, Julie. The Maeva cooperative in this village now has a small roadside eco-shop selling their creations. We filmed how the women dye the raffia using natural and sustainable colors taken from a turmeric root, Curcuma longa, which they replant. They also use dried banana skins, among others agents. Originally from Asia, both ginger and turmeric adapt very well to Madagascar’s climate and are used frequently in Malagasy cooking. These women are featured in our video. Weavers from the Famiova cooperative were also featured in our video. The young children entertain themselves, while the mothers weave their magic. We purchased some incredible scarves at Famiova, which is in the town of Ranomafana. It takes about three days to make one of these fabulous creations. Using sustainably harvested endemic silk and cotton, the women create these scarves, which are unique to Madagascar. In August we will be awarding our first four-year scholarships for high school. 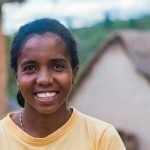 The scholarship committee, which is based in Madagascar, will be evaluating the candidates and selecting two girls who will receive our scholarship awards. An official ceremony will take place at Centre ValBio in Ranomafana to celebrate this accomplishment. As donations grow, we will continue to add more girls each year. Julie, our first student, will be graduating in from high school this June. She will follow her dream and enroll in nursing school in the fall. This is the hope that education inspires, the dream to pursue a career in something that you love. We are thankful that we have helped Julie to attain that dream. Our Facebook audience continues to grow and we now have over 2100 “likes”! Follow us on Instagram and Facebook to keep current with our work. Thanks to a terrific board for helping to keep our engine running smoothly. Our latest newsletter will be coming out soon, so please send us your email if you would like to be added to our list. This fall we are developing a program to bring to high schools. This program will inform young people about Madagascar and the educational challenges it faces. We hope to inspire high school students and clubs to raise funds for our girls in Madagascar. This will help them have an opportunity to go to high school. For as little as $600 a year, that dream can become a reality. We are planning a crowdfunding to launch this fall in conjunction with #GivingTuesday. Stay tuned for more details in the coming months! As we continue to explore collaborations and partnerships, we also have plans for local fundraising events. As a grassroots organization, we rely on donations small and large, so please consider giving what you are able to give. Keep checking in for more details about upcoming events.